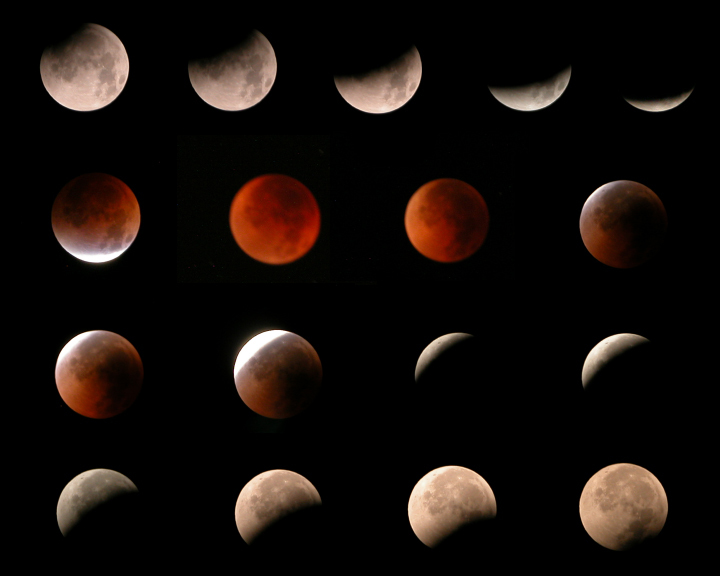 I made this collage showing various phases of the 28 August 2007 lunar eclipse from a sequence of pictures I took from the sidewalk in front of my house here in Southern California. I used a tripod mounted Nikon Coolpix 5700 camera with a telephoto lens. Since I had to go to work the next morning I had intended to only watch part of this late night eclipse but it was such a clear night I just had to stay up until 5:30 to see and photograph all of it. I was not entirely alone all night enjoying this phenomenon. Around 3 AM I heard a noise and turned to find a young possum had come up behind me to see what I was doing.